Viruses have often been described as the ultimate parasite, shedding all of their nonessential parts and leaving behind an extremely efficient genetic transfer apparatus. Phage viruses have evolved to infect various bacteria proficiently and hijack their replication machinery to make more viruses. Yet, this often doesn’t preclude a different virus from concomitantly infecting the same bacterium and competing with or overtaking the original phage invader. However now, researchers from the University of British Columbia (UBC) have recently described their findings surrounding a phage virus that infects major freshwater bacteria, which appears to use stolen bits of immune system DNA to highjack its host's immune response. Specifically, the investigators found that cyanophage N1 carries a CRISPR DNA sequence, which is generally used by bacteria to fight off viral infection. CRISPR’s— clustered regularly interspaced short palindromic repeats— are libraries of DNA typically used by bacteria to identify, and then destroy, infecting viruses. In the past several years, researchers have adapted the bacterial defense mechanism as a gene editing and manipulation technique with great therapeutic potential. The UBC team stated that the N1 virus likely uses the theft to help cyanobacteria—from the ecologically important Nostoc and Anabaena genera—to fight off infection by other viruses, while continuing to be a suitable host for itself. 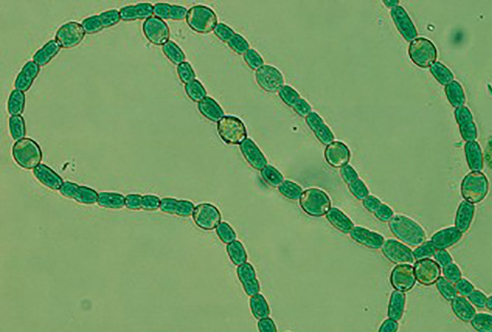 Both groups of cyanobacteria are abundant members of habitats ranging from the bottom of ice-covered polar lakes and hypertrophic coastal lagoons to rice paddy soils and rock-pool communities. Their ancestors were responsible for producing the oxygen on Earth, and close relatives of Nostoc are still responsible for providing a huge portion of the air we breathe.